Julie Murphy intrigues with her facts about animal feet. From paws that grip the ground better than sports shoes to deadly claws and Emperor Penguin feet that can warm an egg throughout the Antarctic winter, every page is a revelation. Julie's use of human comparisons help little ones imagine just how far kangaroos can hop, why webbing is useful and just how strong an owl is. 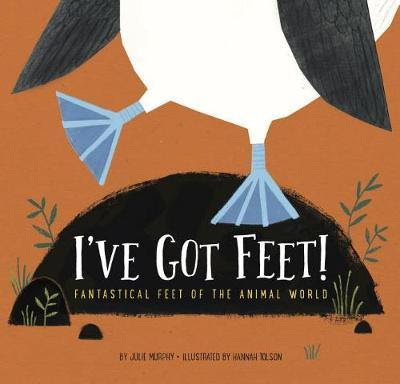 Teamed with Hannah Tolson's use of strong colour contrasts and distinct outlines, I've got Feet makes the perfect preschool introduction to zoology. Not only that, the final-page invitation for children to consider what their feet can do is the perfect introduction to comparative language for the early school years.